One of the issues that I seem to be continually addressing with people is the nature of eternity. Most people seem to think that eternity is a state in which time goes on forever. This is not an unreasonable idea, but the fact is that the exact opposite is true. Eternity is time-less. There is no time at all in eternity. Everything is in the now. Everything in eternity just IS. And God did say his name is "I AM." God has given us time "down here" so we don't have everything happening at once. Events happen one after the other for us in our universe. Occasionally two things do happen together, simultaneously, and look at the trouble that gives us. What would it be like if everything happened simultaneously? We find this idea of timelessness difficult to comprehend, mainly because we have only ever experienced life in which time is an essential and controlling ingredient. So I have developed a few simple illustrations to help people see the difference between the eternity where God IS and the ages where we currently live. An advertisement for an upcoming series on TV says there will be 6 episodes and then shows us a peek preview of the first episode. It even tells us when the series will begin being telecast. How does the advertiser know there are 6 episodes, and how can he show us a peek preview of an episode that has not even been aired yet? The Train on the Back Fence. The View from the Hot Air Balloon. In Revelation 4, John was told to "Come up here, and I will show you what must take place after this." How many books have been written by Christians, also confined to the space-time realm, trying to establish the order of arrival of all the things John, and the other prophets, have been shown? Maybe we just have to get ready for them all, then wait and see. Remember the TV Game Show called "Tell the Truth?" The show featured a panel of contestants who tried to correctly identify a certain character who was accompanied by two impostors. As a result of questioning the character and his/her imposters, the panel had to choose which of the three was the real character. The real character was required to always tell the truth, but the imposters were permitted to lie in answering the panel's questions. After the panelists had made their choice of which character they thought was telling the truth, the real character was asked to stand up and identify him/herself. Sometimes the impostors had done such a good job in their deceiving role, the panel was totally surprised when the real character was revealed. This reminded me of the real God accompanied by the impostor Gods of mainstream christianity. The Calvinist God has the ability to save all mankind, but doesn't choose to. 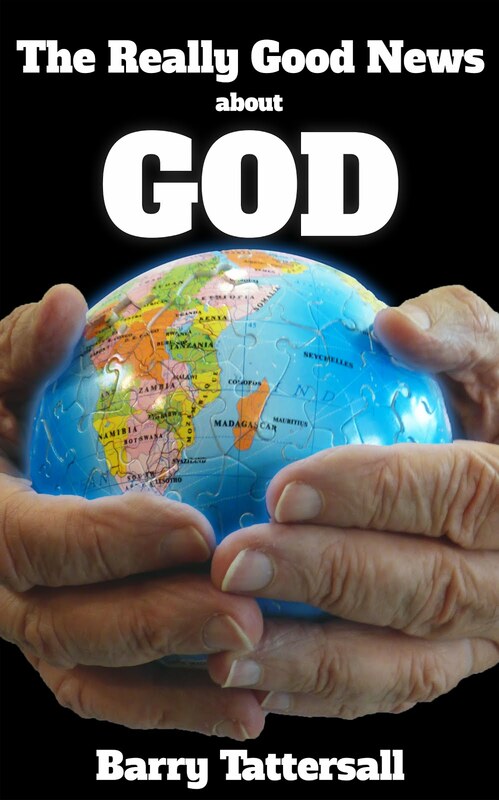 The Arminian God wants to save all mankind, but does not have the power or ability to. The real God, the God of the Bible, has the will, power and ability to save all mankind, and sent Jesus to be the Saviour of the world to make sure it happens. We need to encourage people, and especially those in the churches, to start asking questions about the character and actions of the presenting Gods, to see if they can determine the real character, the One telling the truth. Eventually the real God will stand up, much to the surprise of those who have been deceived by promoters of the impostors. In a recent comment to the "Trustworthy Sayings" post, I mentioned that Rog's linking of hardships with God's refining fire reminded me of Paul's comment about temptations in 1 Corinthians 10 : 13. Here's the NIV translation of this verse. It is typical of most English translations, but does it make sense? ..... God will provide a way out or a path of escape so that you can endure the temptation ????? How can you endure something by avoiding it? What is your own personal experience of facing hardships, temptations and crises? Does God usually provide you with a way of escape? If you're like me, that rarely happens. He is more likely to provide encouragement, wisdom, strength, endurance or some other way for us to grow and mature and become Christ-like, rather than a way to remain weaklings looking for outs, excuses and escape chutes. What Bible character was ever given an escape route? Moses, Joseph, Job, Jonah, David, Hosea, Paul, Stephen, Jesus ???????? Have a quick flick through Hebrews 11. God sees that the size of the problem is never more than we can cope with, but there is usually no escape from it. So I began researching the translation of this verse. If God is sovereign, and all is from him, through him, and to him, then we can be sure that any trial that God brings our way will also have its planned outcome in place, ready to be experienced also. So we need to trust God in all our trials and hardships, because he will also have the planned outcome ready to be achieved as well - not an escape chute so we can avoid the refining fire and growing experience God desires for us. There are so many verses in the Bible that are badly translated into English, poorly interpreted or used without any consideration being given to their context in order to bolster someone's previously-decided point of view. Hebrews 9 : 27 is such a verse. Although this verse is usually quoted alone to make a point, notice that it is only the first part of a sentence crossing two verses that has the familiar "Just as ...... so ......" structure that we have run into several times before. But apart from this small point, what is the verse usually claimed to be referring to? All people die once then immediately face judgement. The result of that judgement - saved or damned - is final and determines everyone's eternal destiny. As you well know, there are many aspects of this standard interpretation that are not in harmony with other correctly translated Scriptures. But, even worse, this common interpretation is totally inconsistent with its context. Let's have a look at its context. The book - is written to the Hebrews, to Hebrew Christians, explaining God's new covenant with Israel, and contrasting it with the Old. The chapter - is discussing the work of Jesus as High Priest of the New Covenant, as compared to the work of the high priests of the Old Covenant. The verse - is discussing what happens after the inevitable death of "the men." Looking at this context, what "men" is the verse talking about? Clearly it is talking about the high priests of the Old Covenant. And what judgement follows their death? Numbers 35 gives us Gentiles a clue to what these Hebrew Christians would have known instinctively. Numbers 35 talks about the towns for the Levites (the priestly tribe) and the Cities of Refuge. Cities of Refuge were for those who were guilty of manslaughter (killing someone by accident, rather than by deliberate intent) so they would not be put to death for their man-slaying. Such people were to remain in these cities until the death of the high priest. After his death, the man-slayer was judged to be free of any further detainment or payment for his man-slaying. He was then restored to his original community. Interesting - the judgement after the death of the high priest was a restoration or reconciliation!!! To finish this post, look at the next bit of the sentence that stretches across to verse 28. Does this shed some fresh light on this "terrible" verse for you? Don't let anyone throw you off course with the standard Gentile interpretation again. And if God leads you to offer this "anyone" an alternative, maybe WITH HUMILITY AND GRACE, you could ask if they have considered the context of the verse. On my journey through Revelation (again), I lingered at chapter 21 verse 5 (again). I'm a sucker for verses like this one. Then he said, "Write this down, for these words are trustworthy and true." This is a trustworthy saying that deserves full acceptance. What a pity more people don't believe God when he says things like this. And especially when he tells us that these statements are trustworthy. This situation begs a huge question for me. Don't Christians trust God, even with his trustworthy sayings? I think so many, and particularly Christian leaders, have a lot to answer for. They discount God's love and sovereignty. They diminish the significance and value of Jesus' death and resurrection. I wonder what these leaders think of God's stated purpose to be the Saviour of the world and to have everyone bowing their knee and confessing the Lordship of his Son. I've even found pastors who become angry when I suggest that God saving all people might even be a possibility. We've got a long way to go before we become Christ-like, haven't we? The first draft of the next chapter is hiding in the usual spot. I will leave it up there for the month of June.